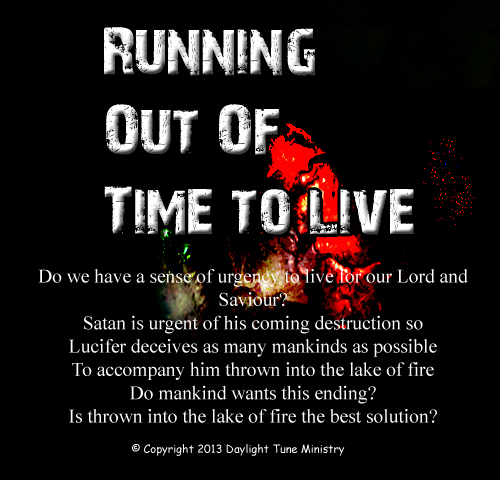 Posted in Acrostic, Poetry and tagged Abba, Bible, Christ, Creator, Deceive, Destruction, devil, Father, Fire, God, Heavenly, Holy, Immanuel, Jesus, Lake, Lord, Lot, Lucifer, Messiah, Rot, Running, satan, Saviour, Scripture, Sense, Son, Spirit, Time, Urgent, Word. Bookmark the permalink. Abandonment is the most painful feelings and memories. Thinking of it, some words define the acronym of abandon. But writing blocks occurred. Next day, more words define every letter and stuck again. Until the final day, all the blanks are completely filled in. 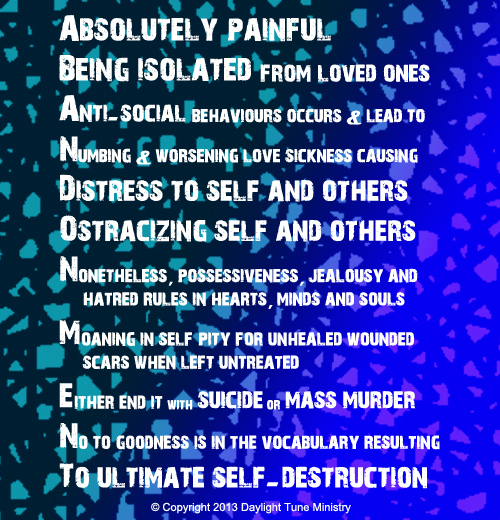 Posted in Acrostic, Poetry and tagged Abandon, Abba, Absolute, Anti, Behaviour, Christ, Creator, Destruction, Distress, end, Fatal, Father, First, Future, God, Goodness, Hatred, Heal, Heart, Heavenly, Holy, Immanuel, Isolate, Jealous, Jesus, Lord, Love, Loved, Mass, Messiah, mind, Moan, Murder, Negligence, no, Numb, One, Ostracize, Other, Painful, pity, Possessive, responsibility, Rule, Scar, Self, Sick, Sickness, Social, Son, Soul, Spirit, suicide, true, truth, Unhealed, Vocabulary, worsen, Wound. Bookmark the permalink. The Lord said to Moses at Mount Sinai, “Speak to the Israelites and say to them: ‘When you enter the land I am going to give you, the land itself must observe a Sabbath to the Lord. For six years sow your fields, and for six years prune your vineyards and gather their crops. But in the seventh year the land is to have a year of Sabbath rest, a Sabbath to the Lord. Do not sow your fields or prune your vineyards. 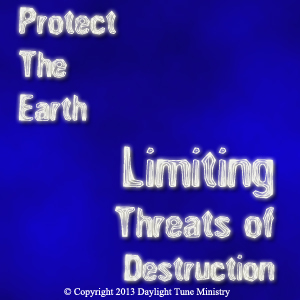 “Protect the earth” repetitive words came when I think about the scarcity of food in the future. Then I realised it produced the acronym of Pte. Though I was stuck with the word “threat”, thank God for the final word at night. Posted in Acrostic, Poetry and tagged Christ, Creator, Destruction, Earth, God, Holy, Jesus, Limit, Limited, Lord, Ltd, Private, Protect, Pte, Son, Spirit, Threat. Bookmark the permalink. Words birthed out of me, “Devastation Diabolical Destruction Emerge Cloak” as my imagination floating around. Then other words flowed out as I surrender to my imagination. Posted in Metaphor, Poetry and tagged Animal, Christ, Cloak, Creator, Destruction, devastation, Devour, Diabolical, Flower, Frustration, God, Holy, Imagination, Innocent, Jesus, Larva, Lord, Magma, Metaphor, mountain, People, Poetry, Psychology, Rage, save, Seek, Shepherd, Son, Spirit, Tree. Bookmark the permalink.